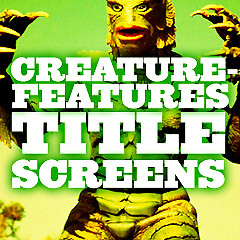 Movie Title Screens - Sci-Fi & Creature Features of the Mid-20th Century (the 1950s): Title screens are the initial titles, usually projected at the beginning of a film, and following the logos of the film studio. They are often an ignored aspect of films, although they reflect the time period or era of the film, the mood or design of the film, and much more. Science fiction films took off in the early 50s during what has been dubbed "the Golden Age of Science Fiction Films," pioneered by two 1950 films: Rocketship X-M (1950) and Destination Moon (1950). Many of these films were exploitative, second-rate sci-fi flicks or B-movies with corny dialogue, poor screenplays, bad acting, and amateurish production values. Many other sci-fi films of the 1950s portrayed the human race as victimized and at the mercy of mysterious, hostile, and unfriendly forces, during the Cold War period of politics - with suspicion, anxiety, and paranoia of anything "other" - or "un-American." These moods were reflected allegorically in sci-fi and horror films of the era. Threats and evils surrounded us (alien forces were often a metaphor for Communism), and there were imminent dangers of aliens taking over our minds and territory. UFO sightings and reports of flying saucers or strange visitors from outer space found their way into Hollywood features as allegories of the Cold War. With the threat of destructive rockets and the Atom Bomb looming in people's minds after World War II, mutant creature/monster films featured beasts that were released or atomically created from nuclear experiments or A-bomb accidents. The aberrant, mysterious and alien monsters or life forms that terrorized Earth were the direct result of man's interference with nature. These profitable, low-budget horror/sci-fi/thriller hybrids were perfect for non-discriminating teenagers who attended drive-ins - caring little for character development, plot integrity or production values. Examples of these low-budget 50s films (many of which bordered the horror genre as well as adventure, fantasy, thriller and sci-fi) included The Thing from Another World (1951), It Came from Outer Space (1953), The War of the Worlds (1953), Them! (1954), Tarantula (1955), Forbidden Planet (1956), The Amazing Colossal Man (1957) and Attack of the 50-Ft. Woman (1958).